· Use a transparent or translucent cylindroconical cone or tank. · Supply air through open aeration line down to the tip of the conical part of the tank. · A valve at the tip of the tank will facilitate the harvesting of the live artemia. · Hatching temperature of distilled water, (28 Celsius) (84 Fahrenheit). · PH should be 8.75to 8.85. · Salinity should be 20-30 parts per thousand (ppt) salt solutions or approximately 3% salinity. · Illumination should be 2000 lux at the water surface, entire 24 hour hatching period. · The density should be 1.6 gram per litre warter. · The hatching time should be 24 hours. · Storage -15 to 6 Celsius for up to 6 months. Keep out of direct sunlight.
. If you take the artemia cysts from storage, please keep 12 hours outside, then to hatch. · Use open cans as soon as possible. Start with any clean see through container. For large hatcheries, large conical shaped containers work best. Hook up an air hose from the air pump so that it bubbles from the bottom of the container. Fill with clean filtered or treated water. Add salt to prepare water to specific gravity of 1.022. Clean filtered sea water may be substituted. Bubble the solution gently. 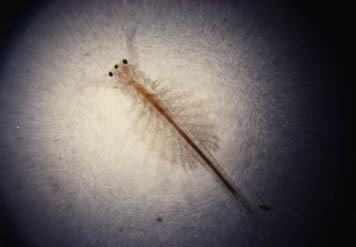 When the salt has dissolved, add the specified amount of Artemia eggs. Keep the bubbling solution at (80 degree F) 28 degrees C, making sure the eggs are moving within the solution for *24 to 36 hours. Shut off the air and let settle for 10 min. Harvest the live baby shrimp Nauplii from the middle of the water by suctioning with a tube into a tight weave material net. Rinse the salt off with clean water and feed directly into the aquarium or growing tanks immediately. prefer to wait 36 to 48 hours for a complete hatch before harvesting.